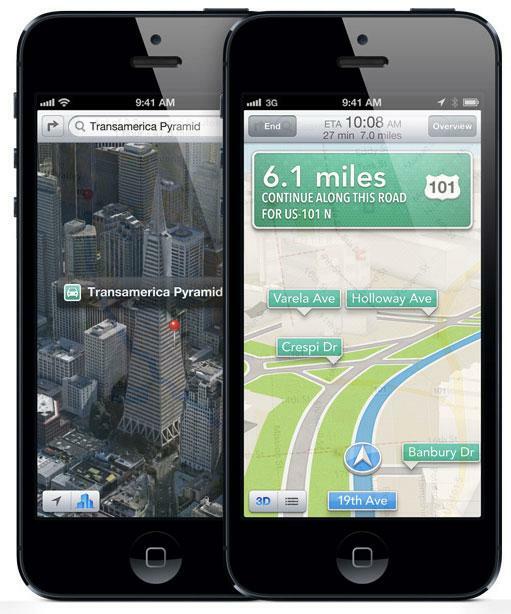 The GPS navigation team at Consumer Reports has been testing the iPhone 5, and determined that Apple's new Maps application in iOS 6 has "much maturing to do" before it can compete with other turn-by-turn services. Still, the consumer advocacy group's initial impressions of the iPhone 5 have been largely positive following last Friday's launch. The organization has found that the iPhone 5 is a worthwhile improvement over the iPhone 4S "in spite of a mapping app that's disappointing, at least so far." Though iOS 6 Maps were highlighted as the "biggest drawback" of the iPhone 5, Consumer Reports also said the software is "likely to improve over time." Still, Consumer Reports did have a few positive things to say about Maps in iOS 6  namely the simple interface designed by Apple. The organization also praised the larger 4-inch display of the iPhone 5 with reduced glare, and the lighter weight as compared to the iPhone 4S. Their testing also found that the new 4G LTE radio is speedy and the A6 processor helps to load content faster. The camera, however, was found to be just a "modest step up" from the iPhone 4S. They found that still shots and video look crisper and sharper with the iPhone 5, but did not find any apparent improvements in low lighting footage. Consumer Reports made waves in 2010 when it ranked the iPhone 4 the best smartphone available on the market, but later changed its stance and stated it couldn't recommend the iPhone 4. The group tested the iPhone 4 inside a controlled radio frequency isolation chamber, and found that covering the bottom left corner of the handset with one's bare hand could reduce reception. The group took a more favorable view of the iPhone 4S when it was released last year, stating that any reception issues were addressed with the updated handset. And this year, it tested the new iPad and found the device could reach temperatures of 116 degrees Fahrenheit, calling it "warm but not especially uncomfortable if held for a brief period."